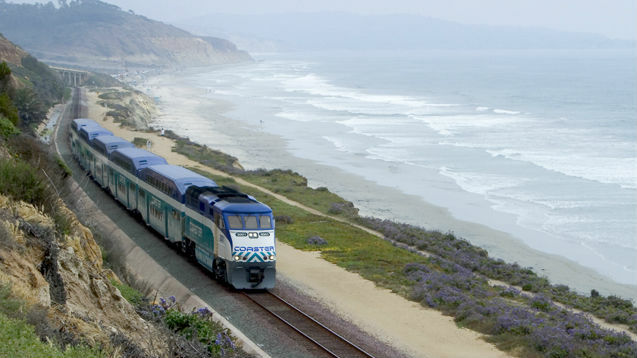 Twenty years ago Friday, the first commuter rail service began between Oceanside and downtown San Diego, with basic four-car COASTER trains making only six trips each way. In its first year, the North County Transit District‘s COASTER handled 700,000 passengers. Today, annual COASTER ridership is over 1.7 million. The district will mark the two-decade milestone with customer-appreciation activities through the end of March, including a social media photo contest. A complete timeline of the COASTER program is available online. There are now 11 trains on weekdays in each direction stopping at eight stations. The trip from Oceanside to downtown San Diego takes about an hour. The transit district said future plans call for a new station at Camp Pendleton, along with limited use stops at the Del Mar Fairgrounds and San Diego Convention Center.